Satisfied—and a little bored—by his success as a kingmaker, through the simple summoning of his gifted mind, he recedes into the shadows to write his Arthashastra, the ‘science of wealth’. 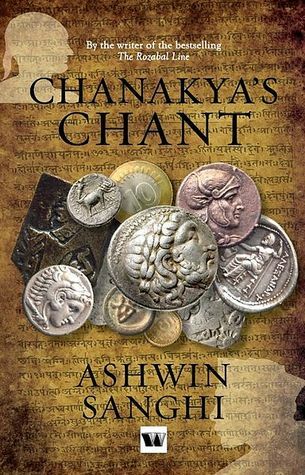 But history, which exults in repeating itself, revives Chanakya two and a half millennia later, in the avatar of Gangasagar Mishra, a Brahmin teacher in small town India who becomes puppeteer to a host of ambitious individuals—including a certain slum child who grows up into a beautiful and powerful woman. Modern India happens to be just as riven as ancient Bharat by class hatred, corruption and divisive politics and this landscape is Gangasagar’s feasting ground. Can this wily pandit—who preys on greed, venality and sexual deviance—bring about another miracle of a united India? Will Chanakya’s chant work again? I had read this book quite some time back and a review of the same has been long due. I had great expectations from this book but, somehow I feel that it didn't really live up to my expectations. And that is not without reasons. The blurb is alluring, the plot is good but the narration falters. The Chanakya part is reasonably fine, but I couldn't relate even a bit to the character of Gangasagar. Many incidents and events in the book are exaggerated. I didn't get the motivation behind Gangasagar's actions. To top that, just like in a hero in Bollywood movie he does whatever he likes and gets away with it every time. I also didn't like the way Chandni's character is portrayed. The book could have been better edited and could be reduced by some 100 odd pages. The author has tried to draw parallels between today's politics and that of ancient times and has succeeded to some extent. This book is fine if you are looking for a casual read. The story is quite predictable so, you won't have to strain your brain much. But, if you are looking for a classic political thriller, there are better options. Decide for yourself.